Have you ever really wanted to try something, but you kept putting it off because you just weren’t sure if it would actually work? I have. In fact, as a naturally cautious (if not downright paranoid person) this tends to happen to me a lot. I have had I don’t know how many tv shows in my Netflix Instant queue for months. I put them there because I initially thought that they sounded interesting and wanted to give them a shot to see if I would like the show. But then, I never start watching them, because I’m juuuuuust not sure if the shows would be something that I liked. I mean, once they’re gone, I can never get those 45 minutes of my life back. I’ve got one loooooooong Amazon wishlist, full of things that I want, but have yet to actually order. But this one may be less about my being paranoid and cautious, and more about me being broke 9 times out of 10. As it turns out, most of the time, when I’m overly cautious about trying something new, it usually has to do with food. I’m NOTORIOUSLY picky/cautious when it comes to my food. I’m “that person” who only ever orders ONE thing off the menu of a restaurant or take out place. I’m far too paranoid that the one time I decide to be ‘bold’ and ‘daring’, and order something new, it’ll blow up in my face and I’ll absolutely hate it. So not only will I have wasted my money, but I’ll also have to choke down food that I don’t even like, resulting in an unsatisfying meal- which is one of my BIGGEST pet peeves. I don’t even like straying from the script when it comes to my coffee. My general philosophy with food is, if it ain’t broke, then I sure ain’t gonna try to fix it. But sometimes, I break character and try to eat and cook new foods. It turns out that having a food blog will give you a rather sizable boot in the rear, so far as that goes. As a result, I have a full Pinterest board of recipes from other blogs and websites of foods that really caught my attention and made me want to try out for myself. Today’s recipe was one of them; it’s been there for over a year at least. See? I told you I was overly cautious. 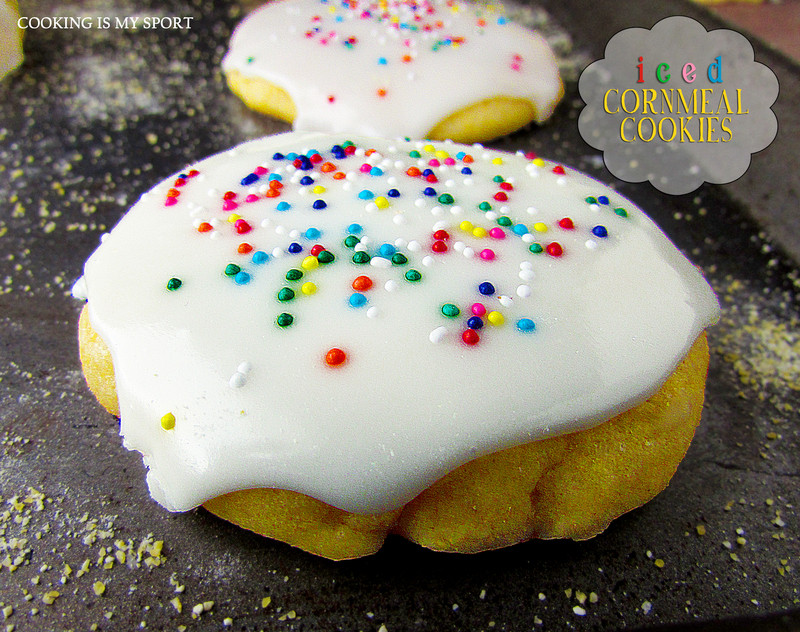 The most intriguing element to this recipe for me was the inclusion of cornmeal in the cookie dough. I was just wildly curious as to what that would taste like; I had SO many questions. Would the cookies be sweet? Would the texture be too rough/coarse because of the cornmeal? Would they be soft or crunchy? Would they even taste good at all? For my own personal preferences, I decided to bake the cookies for as little time as possible so that they would be soft. I assumed by the smell and taste of the raw dough (yes, I eat raw cookie dough. Don’t judge me) that they would be similar to sugar cookies. 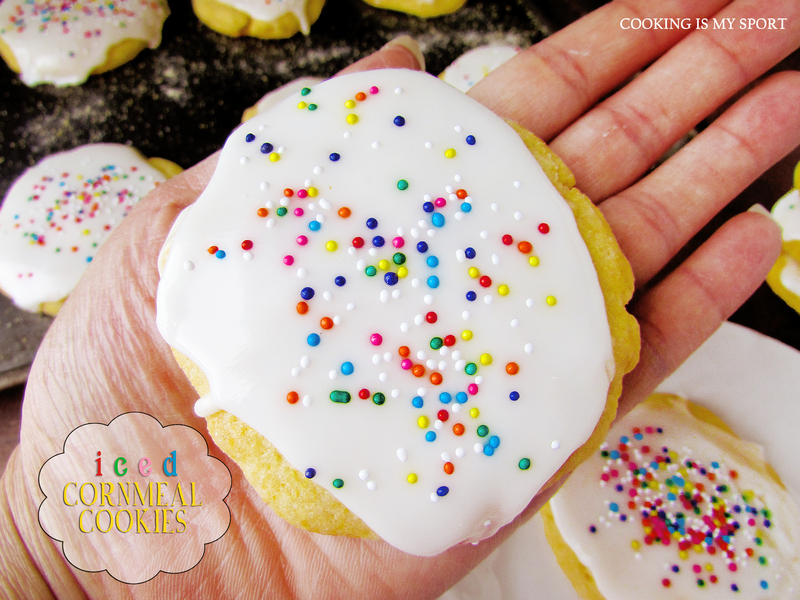 And I insist upon having my sugar cookies iced. 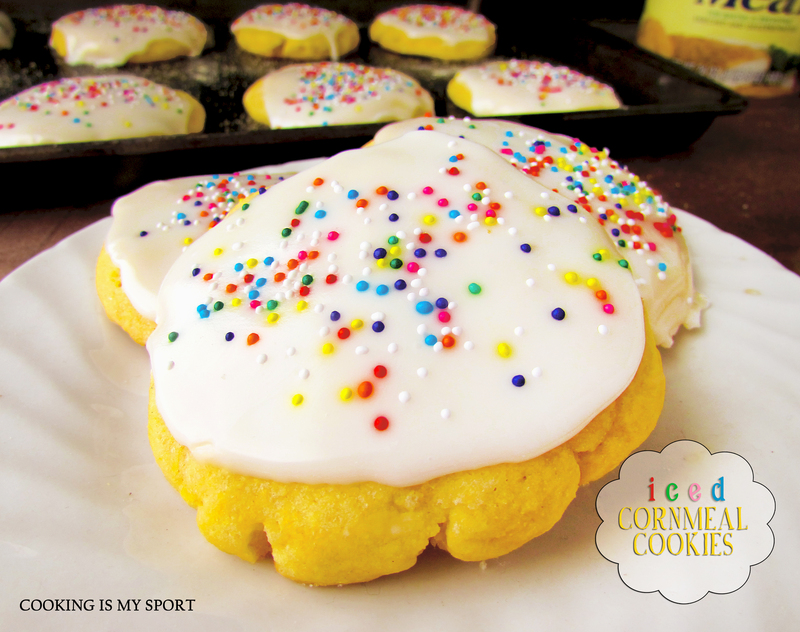 So I then whipped up a quick and easy icing to spread on top and added nonpareils for color. Well first of all, they’re very good. So that was a huge relief. Second, I can honestly say that I’ve never had cookies like these before ;the cornmeal is really the star ingredient here. It gives the cookies such a unique texture and flavor. Although I went with vanilla extract and icing, I could see citrus zest like lemon or orange working VERY well with these. Preheat oven to 350 degrees. In a medium bowl, whisk together flour, cornmeal, and salt; set aside. In a large bowl, using an electric mixer, beat butter and sugar until light and fluffy. Add egg and vanilla; beat until smooth. With mixer on low, gradually add flour mixture, mixing just until combined. Drop dough by heaping tablespoons, about 2 inches apart, onto two large baking sheets; flatten slightly with floured fingertips. Bake until edges are golden, 14 to 16 minutes, rotating sheets halfway through. Transfer cookies immediately to a wire rack; let cool completely. For Icing: combine the first 3 ingredients until smooth. 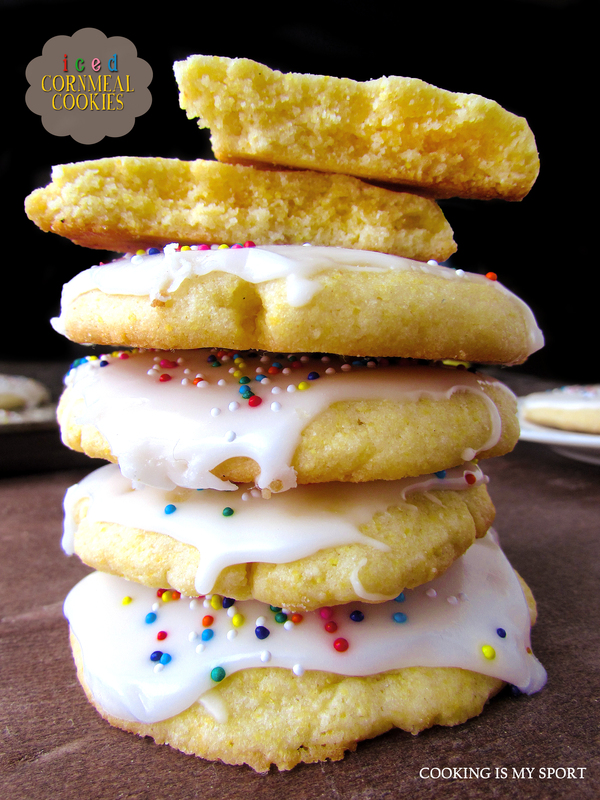 Spread over cooled cookies, then decorate with nonpareil sprinkles. Allow icing to harden, about 30 minutes. yes! I feel the same way about macarons – just too anxious to attempt to bake them. But yay for you for trying these cookies – they look incredible. For me, I think being more cautious is good, I’m completely different I tend to jump into things and give into impulses all the time. Once I start thinking I’m like damnit in just gonna give it a go! ESP when it comes to cooking… I’m often making a mess in the kitchen and then trashing my ideas cos they were not good enough. Anyway, These look amazing! 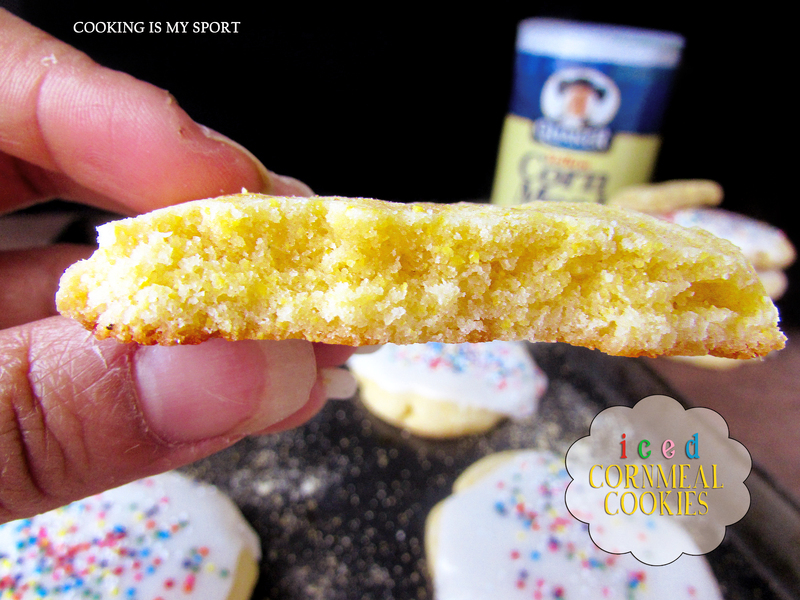 I’ve always loved cornbread so I’m totally up for these! Awesome, thank Bonnie. They’re unique cookies, but I still really liked how they turned out! What a fun recipe. I will have to try it sometime. So glad you stepped out of your comfort zone to bring this recipe to us. I myself love trying new foods all the time and encourage our boys to do the same. Experimentation is fun, even if not always successful. These cookies look amazing, Jess! I would never have thought to use cornmeals in my cookies!